Social purchasing startup LivingSocial has raised $25 million in series B funding, the company announced today. The round was led by U.S. Venture Partners, joined by existing investors Grotech Ventures and Steve Case’s Revolution, LLC. LivingSocial has now raised $35 million to date. 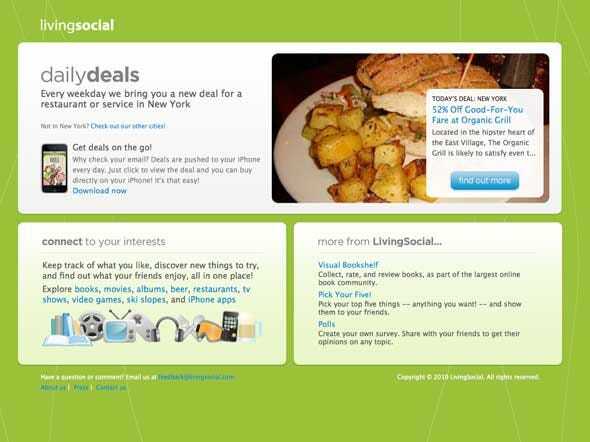 LivingSocial is one of dozens of new startups following Groupon in offering daily discounts that encourage consumers to convince their friends to sign up. But unlike most of these companies, LivingSocial got its start before the group buying craze hit, developing Facebook apps. CEO Tim O’Shaughnessy says this gives his company an edge in the space. 40-45% of consumers who sign up for LivingSocial deals do so through Facebook Connect, which he says is “absolutely huge” when it comes to viral distribution. LivingSocial also announced that it was extending its service to four new cities, bringing its total to 13. It plans to use the new funds (as well as its growing revenue stream) to expand to “dozens” of cities by the end of the year. This is a promising industry, and while we aren’t convinced it needs as many companies as it has, LivingSocial is a better bet than most going forward.